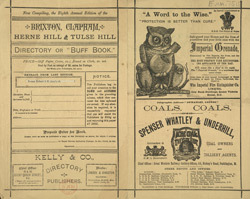 This is an advertisement for Kelly’s directory of Brixton and Clapham. Trade directories originated in the 17th century to provide useful addresses for local businessmen. By the 19th century most cities and towns had directories that listed all local tradesmen and professionals along with details of the local area’s history as well as providing information about transport services and newspaper circulation statistics. These directories were usually used by the post office but were printed privately. Kelly’s directories date from 1845 and are printed in many volumes each containing information about particular counties or boroughs.